Pennsylvania is the perfect place to visit anytime of the year. The summer is an exceptional time to visit and see the interesting historical sites, try the local cuisine, and just experience the area. As you think about all the places to visit in PA, put Bethlehem on your list. This charming town is full of adventure just waiting for you! Come stay at the beautiful Sayre Mansion, discover the hidden gems of Bethlehem and create unforgettable memories! Here are just a few reasons why you should put Bethlehem on your list of places to visit in PA! Has Anyone Seen My Balloon? Private Tours are so, so cool! Set flight with one of the many trained captains on your very own private balloon tour. This amazing experience is a must-do activity when staying in Bethlehem. 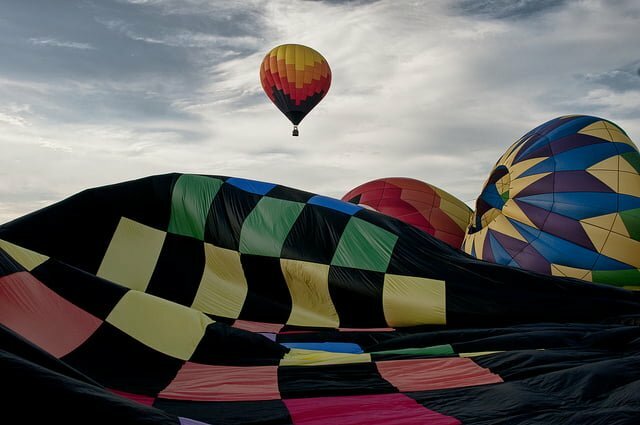 Help the captain fly the hot air balloon over the picturesque Pennsylvania countryside! The Bethlehem Steel walking tour is an easy and great way to learn about the history of the factory and the surrounding area! The guides are very knowledgeable and provide guests with a great presentation. As you walk the grounds, your guide will give you an overview of the former steelworkers. Upon entering the factory you will be greeted by steelworkers, who will explain the process of making steel. The tour is worth your time! Apollo Grill Inc. serves divine food in a wonderful atmosphere! The friendly and attentive staff will make your visit to the area and restaurant memorable. The beef brisket sandwich is perfection! Don’t forget to end your meal on a sweet note with one of their many scrumptious desserts. Hanover Eatery is a wonderful establishment whipping up sandwiches to homemade chocolate chip cookies. The newly remodeled building is in ship shape making your dining experience an enjoyable one! The homemade Shrimp Bisque is hot, creamy and delicious! Pair it with a turkey club and the meal is complete. Molinari’s serves the most delicious Italian food in Bethlehem! Each dish is incredibly delicious, prepared to perfection. There is sure to be something on their unique menu that will satisfy your palate. The wonderful staff, full bar, and divine food make for the perfect evening when staying in Bethlehem. The special white pizza with broccoli is mouthwatering! Another great eat is at the Blue Grillhouse! Open for lunch, Blue’s service is fantastic and the food is just as good. The bar offers a wide selection of wine and other beverages. The elegant setting, perfect steak, and pristine wine, makes for a terrific dinner! When deciding on what places to visit in PA, don’t forget about Bethlehem. Not only does the town offer interesting tours and delicious food but also a fantastic place to stay. Book your room at the Sayre Mansion for an unforgettable experience and request our vacation guide to learn more on what there is to do in the area. Our Bethlehem bed and breakfast is the ideal place to plan out your adventures and recharge between activities. Luxuriate in one of our elegantly appointed rooms and enjoy the charm of the past with all the modern conveniences you need in a home away from home. Plus, your stay includes a full breakfast each morning so you can take on the day ahead. Let the Sayre Mansion take care of you during your Lehigh Valley vacation for an unforgettable experience. See you soon!